At 1300 on April 6, 1945, Flight Petty Officer 1st Class Zenichi  Jinushi took off from Kushira Air Base as pilot in a Type 97 Carrier Attack Bomber (Allied code name of Kate) carrying an 800-kg bomb. 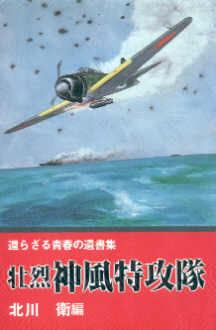 He was a member of the Kamikaze Special Attack Corps 1st Hachiman Gokō  Squadron from Usa Air Group. He died in a special (suicide) attack off Okinawa at the age of 18. He was from Mie Prefecture and was a member of the 17th Otsu Class of the Navy's Yokaren (Preparatory Flight Training Program). It has reached the time when cherry blossoms are beginning to bloom. I have great joy since everyone in the family is doing well. I am in high spirits as usual as I work hard at my military duties. I think that the mountains in our hometown must have springtime haze hovering above them and have especially delightful things to view. The war situation has become more and more intense. At this critical time for the country, there is nothing that surpasses the honor of a young man's long-cherished desire of my falling as a flower. I do not know even the right words to express my apology for not showing any filial piety to you as my parents who lovingly raised me for about 20 years from my birth on July 9, 1926, until now. However, when I fall as a cherry blossom in the skies of the southern seas, I trust that you certainly will be glad. Please smile, and I earnestly ask you not to shed any tears. If a flower has bloomed, it is prepared to fall. If I fall along with an enemy ship, why would there be any regrets? When there is a letter saying that I have fallen splendidly, please say, "Zenichi, attaboy," and cry out, "long live the Emperor." After all is said and done, if we have responsibility for the country's survival, we truly bear on our shoulders the duty to save it from this danger. When you sent me to the Navy, I know that I have been prepared for this time. I warmly thank Older Sister also for giving me all sorts of care and for showing concern for me in many ways even after I entered the Navy. When we sent off Older Brother to the Army, I on my own realized again and again that I protected the family and that indeed things were not as usual. Finally, I will not stop praying for your health and happiness. When this letter arrives at the house, it probably will be the time when cherry blossoms will be in full bloom and will be fluttering down. Since at that time I also will fall magnificently like the cherry blossoms, I ask that the family be at ease. Give my regards also to Older Brother. I earnestly am praying for the happiness of the family. Farewell. The letter comes from Kitagawa (1983, 114-6). The biographical information in the first paragraph comes from Kitagawa (1983, 114) and Osuo (2005, 214). 1. The Japanese given name of 善一 can be pronounced as either Yoshikazu or Zenichi. Since the pronunciation of the name could not be determined, the more common pronunciation of Zenichi has been used for this translation based on the number of Google hits for "善一" and "ぜんいち" (Zenichi) in comparison to "善一" and "よしかず" (Yoshikazu). 2. Hachiman is the Japanese god of military power. Usa City in Ōita Prefecture has the first Hachiman Shrine, which was established in the early 8th century. Gokō means "protecting the Emperor" in Japanese.